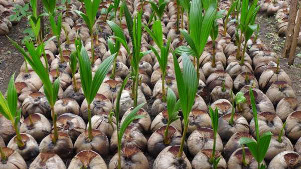 Amurang, North Sulawesi, Indonesia � February 25, 2013 � Cargill, in partnership with Winrock International, is donating 20,000 high quality coconut seedlings to 200 smallholder coconut farmers in North Sulawesi, Indonesia. The program is designed to help local smallholder coconut farmers achieve higher incomes by providing more productive coconut seedlings, donating organic fertilizer and conducting free local training on good agronomic practices and postharvest handling. “Cargill is committed to helping smallholders in the North Sulawesi region improve their livelihoods and the economic opportunities of coconut farming, ” said Lindung Samosir, plant manager of Cargill's coconut processing plant in Amurang. On February 23, 2013, local officials and smallholders joined Cargill and Winrock International at a ceremony in Amurang to hand over the first seedlings for this year's program. Winrock International will serve as the key program partner for this project, helping to develop and deliver training programs to farmers in the region, as well as assist in seedling delivery. The program also will collaborate with government agencies in the region including the local government of South Minahasa, the local plantation office and extension agents' office, and the Indonesian Palm Research Center (Balitpalma). The program uses a three-pronged approach, by providing smallholders free access to improved varieties of coconut seedlings with higher drought tolerance and fungi resistance for replanting; training smallholders in good agricultural practices consisting of improved agronomic techniques, integrated pest management and postharvest management; and providing farmers with organic fertilizers. This program expands and builds upon Cargill's seedling distribution program from 2011, where 10,000 seedlings were donated in the region. Coconut farming has been an important cash crop for the North Sulawesi economy for the past several decades. Copra, the dried kernel of the coconut, is used in the production of coconut oil. The North Sulawesi region has the largest coconut plantation acreage in Indonesia, with 70 percent of the area owned by smallholders. However, coconut production in North Sulawesi has decreased by 60 percent in the last five years. The North Sulawesi Plantation Department estimates that 40 percent of coconut trees are around 60 years old, at the end of their productive cycle, thus providing smallholders with high quality coconut seedlings to replant is especially essential in this region. Winrock International is a nonprofit organization that works with people around the world to empower the disadvantaged, increase economic opportunity and sustain natural resources. Winrock has been actively working for the development of Indonesia's agricultural sector for nearly 50 years, implementing capacity building programs and providing technical assistance to USDA, USAID and several private companies. Winrock maintains strong relationships with the Government of Indonesia, has an active Memrorandum of Understanding (MOU) with Bogor Agricultural University (IPB), and frequently collaborates with international local NGOs.